Not to be confused with Appley Bridge near Wigan. Apperley Bridge is a village in the metropolitan borough of the City of Bradford, in West Yorkshire, England in the Idle and Thackley Ward. Apperley Bridge is north-east of Bradford on the boundary with the City of Leeds bounded in the east by Carr Beck and to the south by Greengates. The village straddles the Leeds and Liverpool Canal and the River Aire. It takes its name from the old bridge over the river on Apperley Lane. Parts of Rawdon in Leeds of similar character are included in the BD10 Apperley Bridge postal district. The bridge from which the village takes its name was built in the late-16th century or early-17th century. In 1777 a stone arched bridge was built on Harrogate Road over the canal but the present bridge dates from 1936 and has since been widened. From 1846 until its closure in 1965, Apperley Bridge railway station was situated across the boundary in Rawdon. Off Tenterfields close to the canal were four 19th-century mills; Apperdale Mill (formerly Dyehouse Mill), Oaklea Mills, Valley Mills (Canal Mills) and Whitfield Mill. Apperdale Mill and Oaklea Mills survive close to the canal basin, which is now a pleasure boat marina. Since the 1990s housing has been built in the Tenterfields area between the canal up to Greengates. Valley Mills and Whitfield Mills were demolished to make way for the development, while Apperdale Mill and Oaklea Mill were converted into residential units. Hammonds sauce factory on Harrogate Road close to the canal has been replaced by modern development. In the 2000s the village was considered for conservation area status but was turned down partly because many of its older buildings already had listed building status. Apperley Bridge is in the Idle and Thackley ward. On Apperley Lane is the head office of JCT600 vehicle hire and dealership. Next to the Harrogate Road bridge over the Leeds and Liverpool Canal is Apperley Bridge Quarries. On the canal itself is Apperley Bridge Marina with a cafe, office, and chandler operated by Calder Valley Marine. Regarding leisure and tourism there are several cafes and historic public house / restaurants in the area and the possibility of towpath and field walks. Historic Apperley Bridge village is a collection of buildings and groups of buildings separated by green space, it does not have a square, green, or commercial area that could be identified as a focal centre for the village. The old bridge from which Apperley Bridge takes its name is of ashlar construction with two arches and a partially obliterated inscription by the road edge. Numerous farm buildings, barns, and previously canal related buildings along Apperley Road near Milman Bridge have listed building status. The Dog and Gun, The George and Dragon,* and The Stansfield Arms* public houses are historic former houses, farmhouses and barns. The Woodhouse Grove Methodist Church (grade II listed)  and the Moody Cow on Harrogate Road in Rawdon are notable large buildings. The canal marina has a modern steel, glass, and stone cafe, office and chandler. Close to the marina is the base of an original canal side wharf crane. There are numerous listed buildings in Apperley Bridge to be found on Apperley Lane, Apperley Road, Laburnum Place, the Leeds and Liverpool Canal, Harrogate Road and Waterloo Crescent. There are no schools operating in Apperley Bridge itself, though to the north of the village is Woodhouse Grove School, a fee paying independent day and boarding school. Greengates Primary School is located to the south of the village in Greengates and is the main primary school for Apperley Bridge. The nearest secondary school is Immanuel College in Idle. Apperley Bridge's sports (cricket) ground is on Apperley Lane north of the old Apperley Bridge and there are other sports grounds or playing fields close by between the canal and river. The section known as Rawdon meadows provides the training ground and facilities for Bradford City FC. The Leeds and Liverpool Canal runs east west through Apperley Bridge but its use is by pleasure craft. The Airedale rail line runs east west down the Aire valley, through the north of Apperley Bridge. Apperley Bridge railway station has one train running every hour in both directions on the Leeds to Bradford line and feeder bus services are in place. The main road through the area is the A658 Harrogate Road – Apperley Lane. ^ "Apperley Bridge residents reject Bradford". BBC News. BBC. 11 December 2002. Archived from the original on 13 December 2004. Retrieved 10 July 2008. ^ a b "The Bridge". British Listed Buildings. Retrieved 24 February 2011. ^ a b c "Apperley Bridge – Harrogate Road Area" (PDF). Retrieved 29 January 2011. ^ "Apperley Bridge Station". Leodis – A photographic archive of Leeds. Retrieved 29 January 2011. 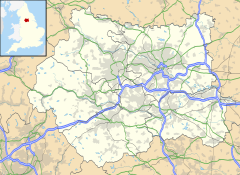 ^ City of Bradford Metropolitan District Council (November 2006). "Apperley Bridge – Summary of report on potential conservation area" (PDF). Archived from the original (PDF) on 20 March 2012. Retrieved 29 January 2011. ^ "Apperley Bridge firm in confident mood". Wharfedale Observer. 15 December 2010. Retrieved 29 January 2011. ; "JCT600 Head Office Car Dealer". JustGoodCars.com. Retrieved 29 January 2011. ^ "Apperley Bridge Marina". Living On A Narrowboat. Archived from the original on 17 April 2011. Retrieved 29 January 2011. ^ "Apperley Bridge Canal Walk". Walks in Yorkshire. Retrieved 12 February 2019. ^ Historic England. "Woodhouse Grove Methodist Church and School Chapel (1261143)". National Heritage List for England. Retrieved 11 January 2015. ^ "The Bridge". , "Stansfield Arms". , and "Walk Hill Farmhouse". Apperley Lane, British Listed Buildings. Retrieved 28 April 2012. ^ "Mill Holme Farmhouse". , "287". , "289". , "Millman Swing Bridge". , "Field House". , "293". & "barn". , "Elm Tree Farmhouse". , and "George and Dragon Inn". Apperley Road, British Listed Buildings. Retrieved 28 April 2012. ^ "2-5". , "6-10". , "Coach House & stables". , "12". , and "13-18". Laburnum Place, British Listed Buildings. Retrieved 28 April 2012. ^ "Bottom Farmhouse". & "Barn". , "Dobson Locks". , "Cottages". , & "Depot". Leeds and Liverpool Canal, British Listed Buildings. Retrieved 28 April 2012. ^ "997". Harrogate Road, British Listed Buildings. Retrieved 28 April 2012. ^ "1-4". Waterloo Crescent, British Listed Buildings. Retrieved 28 April 2012. ^ "Woodhouse Grove". Guide to Independent Schools. Archived from the original on 11 July 2011. Retrieved 29 January 2011. ^ "Apperley Bridge's new railway station opens". BBC News. 13 December 2015. Retrieved 30 December 2015. Wikimedia Commons has media related to Apperley Bridge. This page was last edited on 12 February 2019, at 20:51 (UTC).